Think you’re a diehard resident of the Bay Area? Prove it. Hang this wallpaper—featuring eight local icons like local-food guru Alice Waters and former quarterback Joe Montana—in your home. And then please send me a photo. 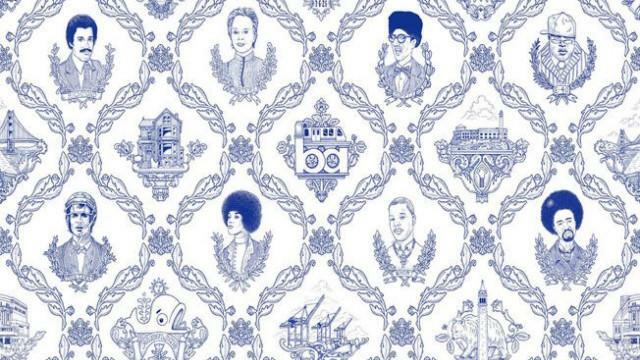 The Lonely Island commissioned artist Matt Ritchie to draw the toile-inspired design because, well, “having Mac Dre and Alice Waters on the same wallpaper seems wonderfully appropriate to the Bay,” according to Lonely Islander Jorma Taccone. I have to admit, I recognized zero of the rappers, but I’d definitely hang Alice Waters on my wall. Would you? Buy the paper on Flavor Papers starting Saturday. And see my other favorite wallpapers here.